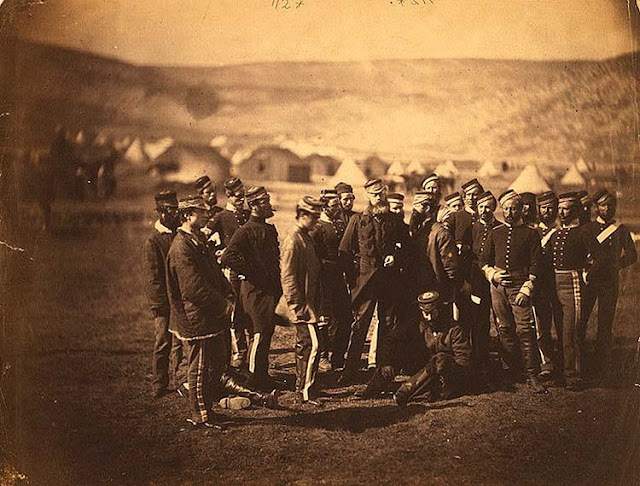 Officers and men of the 13th Light Dragoons who were the survivors of the charge, photographed by Roger Fenton in 1855. The Charge of the Light Brigade was a disastrous charge of British cavalry led by Lord Cardigan against Russian forces during the Battle of Balaclava on 25 October 1854 in the Crimean War. It continues to be studied by modern military historians and students as an example of what can go wrong when accurate military intelligence is lacking and orders are unclear. So now we have seen the Charge of the Heavy Brigade, The Thin Red Line, and the Charge of the Light Brigade. Tune in at October 25th to see how they are related to each other. I'm counting the days to October 25.